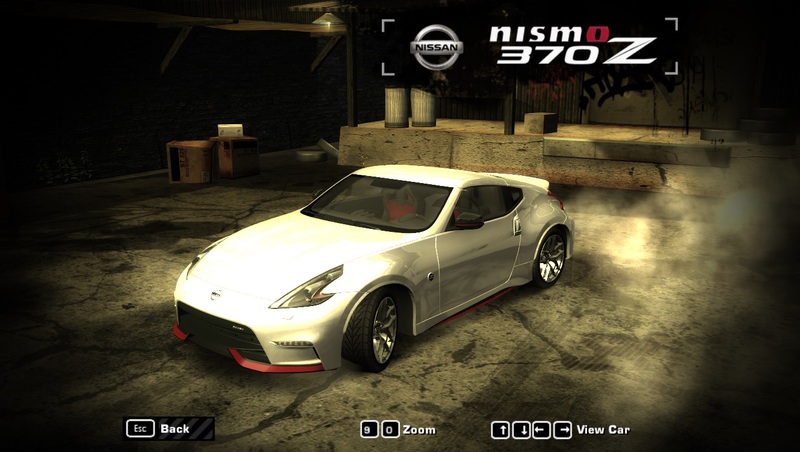 NISMO Nissan 370Z converted from Real Racing 3 as an addon car, meaning no other car gets replaced. - Car model from Real Racing 3. - Everithing works except those listed in "ISSUES"
- Added 4 bodykits containing the colours implemented in previous version just to add a bit of customization. - 2 versions: with bodykits and without. - Added vinyls 1024x and 512x. Only on 4th bodykit if you use the "bodikits" version. - Added lights, exhaust, spoilers and roof scoops. 1- Copy the folder "Cars" or the contents of the folder "No bodykits" to NFSMW installation folder. 2- With NFS-VltEd: File, Import -> ModScript. Select nismo370z.nfsms. From v1.1 those who already imported previous ModScript select only tires.nfsms. Both ModScripts (nismo370z.nfsms, tires.nfsms) contain fixed tire position now. So for new installations you can use only nismo370z.nfsms. Or you can use SavePatcher by MWInside HERE. - No vinyls, decals, numbers, spoilers, roof scoops, lights yet. - Thanks to Ti-Sonic for pointing me in the right direction. @Zvott96 Ok. Do you take requests? I'm asking that question because i want to request 2 cars. @Zieroar Yes I have Discord, my name is Zvott. Nice job. Do you have Discord? I want to chat with you.